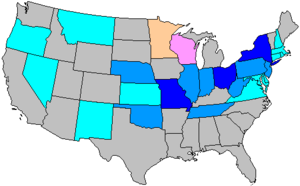 The 1922 United States House of Representatives elections were held for the United States House of Representatives in November 1922 which occurred in the middle of President Warren G. Harding's term. The Republican Party lost a net of 77 seats to the opposition Democratic Party, particularly in some of the traditionally Democratic areas that had been carried by the wave of 1920. An internal split briefly undermined Republican leadership, as progressives and conservatives once again clashed. With Senator Bob La Follette as their unofficial leader, new progressives formed a somewhat small but highly vocal group. Republican troubles were extended when older era progressives who had supported Theodore Roosevelt failed to completely embrace the arguments of La Follette progressives. Republicans nonetheless retained a narrow majority, although splits in the party made it difficult for Harding to govern. In Minnesota, the Farmer-Labor Party, an offshoot of populism, also gained several seats. New York 37 Alanson B. Houghton Republican 1918 Incumbent resigned to become United States Ambassador to Germany. New member elected April 11, 1922. Massachusetts 16 Joseph Walsh Republican 1914 Incumbent resigned to become Justice of the Massachusetts Superior Court. New member elected November 7, 1922. California 10 Henry Z. Osborne Republican 1916 Re-elected, but died February 8, 1923, before the new Congress. Massachusetts 7 Robert S. Maloney Republican 1920 Incumbent retired. Pennsylvania was one of the only states to conduct redistricting between 1920 and 1922, when no nationwide reapportionment occurred. Incumbents have been shown in the most closely corresponding new districts. The four districts shown as new below replaced the four at-large seats used previously; since the at-large seats were all Republican held, the new districts are only nominally Republican gains. "Statistics of the Congressional Election of November 7, 1922" (PDF). Clerk of the United States House of Representatives. Retrieved September 3, 2011. ^ Number of assessed polls, registered voters and persons who voted in each voting precinct in the Commonwealth of Massachusetts at the state, city and town elections. Massachusetts. Office of the Secretary of State. 1921–1922. p. 416. This page was last edited on 28 December 2018, at 10:13 (UTC).